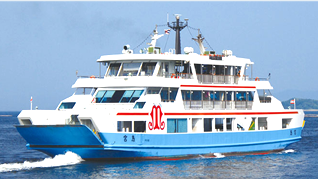 Our Ferries - Miyajima Matsudai Kisen Tourist Ship Co., Ltd.
Aki was designed for both improved comfort and environmental friendliness. 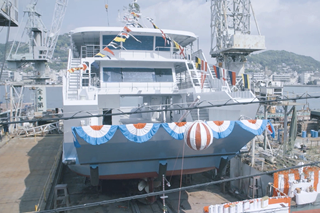 LEDs are used for the ship’s lighting and the use of the latest technologies in the vessel’s maneuvering systems enable the smoothest of turns. 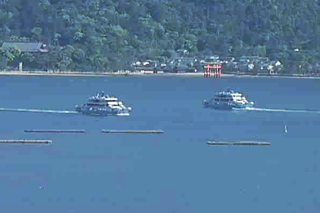 Aki is a safe and comfortable ship and a suitable vessel for visiting the World Heritage Site of Miyajima. 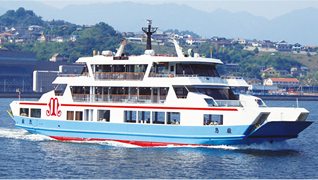 Aki is furnished with a spacious, barrier-free passenger cabin which is designated as priority seating. 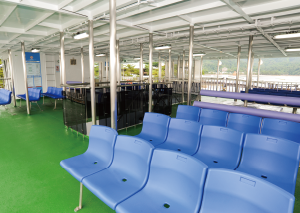 Located on deck one, passengers can spend their voyage in comfort here. The cabin has large windows designed for enjoying the view outside as well as spaces for accommodating up to eight wheelchairs. 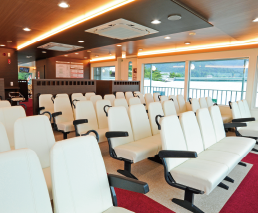 The passenger cabin on deck two is equipped with seating arrangements perfect for families and groups traveling together. 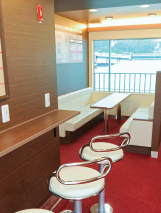 Here passengers can enjoy the scenery outside in a relaxing space with attractive wood accents. An airy observation cabin on deck three. 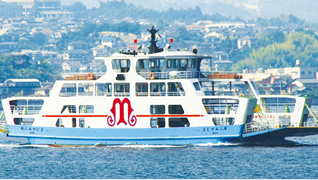 You can feel the brisk sea breeze. The Foundation for Promoting Personal Mobility and Ecological Transportation provided a grant-in-aid to make the brand-new Aki barrier-free.